Danjo Garan- Koyasan's Central Temple Complex | Travel? Yes Please! 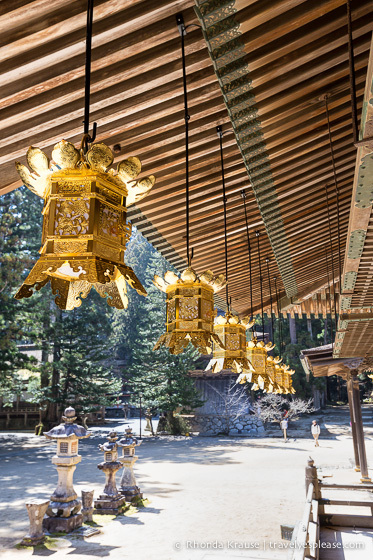 As a sacred site for Buddhism in Japan, Koyasan features many temples dedicated to the practice of Shingon Buddhism. While each is important in their own way, none is as central to Buddhism in Koyasan as the Dai Garan Complex. Since the founding of Koyasan in 816, the Dai (Great) Garan has been one of the most important areas on Mt. Koya. Shingon Buddhist monks have been coming to Dai Garan for over a millennium to study, train and perform important rituals. Today, the Garan is still the centre where Buddhist monks gather for their practices and hold many important annual ceremonies and events. Tourists are welcome to come and appreciate the Garan’s many important halls, shrines and pagodas. Coming from Kongobuji Temple to the east, our approach into Danjo Garan was on a wide path lined with large trees. It was a pleasant and peaceful experience walking into the Garan and I thought it must be very beautiful in the fall when the leaves have turned colour. We passed by some of the complex’s smaller buildings like the Toto Pagoda, Sanmaido Hall, and Daiedo Hall. We even saw a cherry tree planted by famous monk and poet Saigyo. After lingering on the path for a bit we soon came to the main area of the Garan where the Golden Hall and Great Pagoda take centre stage. Major Buddhist services are held in the Kondo, Koyasan’s main hall. 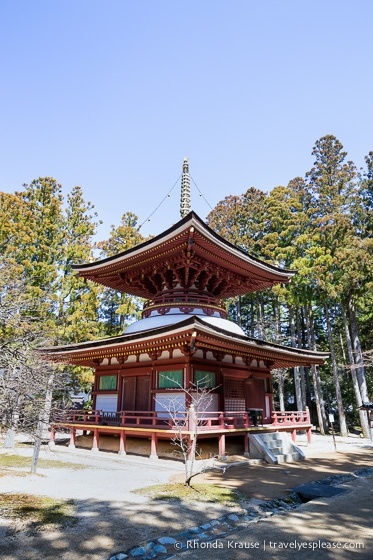 The Kondo has been destroyed by fire six times in its history, the last in 1926. The present hall was rebuilt in 1932 and enshrines a statue of the Medicine Buddha. My favourite structure of the Garan is the Konpon Daito. Kobo Daishi planned the Great Pagoda to be the centre of his monastic complex. At 49 metres high, it definitely is eye catching! Construction of the Daito began in 816 but took nearly 70 years to complete, so Kobo Daishi never got to see it before he entered eternal meditation. The Daito was unfortunately destroyed by fire five times, mostly due to lightning strikes, but was rebuilt each time. The current structure was built in 1934, after a large fire burned through the Garan in 1843. Since there is such a long history of fires in Koyasan, the Daito was rebuilt in concrete with wooden, vermillion coloured overlays added afterwards. I recommend going into the Daito because it has a large statue of the Buddha Mahavairochana (the fundamental deity of Shingon Buddhism) surrounded by the Four Buddhas of the Kongokai. Then around that are 16 pillars with paintings of the Sixteen Great Bodhisattvas. It was really beautiful and I wish I was allowed to take pictures! Other than the Okunoin cemetery, we spent most of our time in Koyasan at the Garan. Something about it really captivated me and I didn’t want to leave. While the Great Pagoda is enormous, colourful and demands your attention, I loved how some of the other buildings were more plain, tucked away in the trees and blending into their surroundings. The Dai Garan is a definite must-see during a visit to Koyasan! Danjo Garan is located on the western side of Koyasan, between the main gate and Kongobuji Temple. It’s free to walk around the grounds of the Garan, but a small fee is charged to enter some of the buildings. Admission to the Konpon Daito is ¥200. It’s open from 8:30 am- 5:00 pm (last admission at 4:30 pm). Admission to the Kondo is also ¥200 with opening hours being 8:30 am- 5:00 pm (last admission at 4:30 pm). *Opening hours and prices were correct at the time of publishing but can change without notice. Please confirm directly with service providers.